On the 443 episode of SBS’s ‘Running Man’, everyone participated in a race to gather enough funds for the unboxing auction. The newest episode of SBS’s ‘Running Man’ had all the members in a frenzy to gather interesting objects to fund for the ‘unboxing auction’. Members were told to bring an object that you don’t use but can’t bear to throw away. Opening scene starts off with the dongsengs making fun of Yoo Jae Suk and Ji Suk Jin for wearing similar jackets. 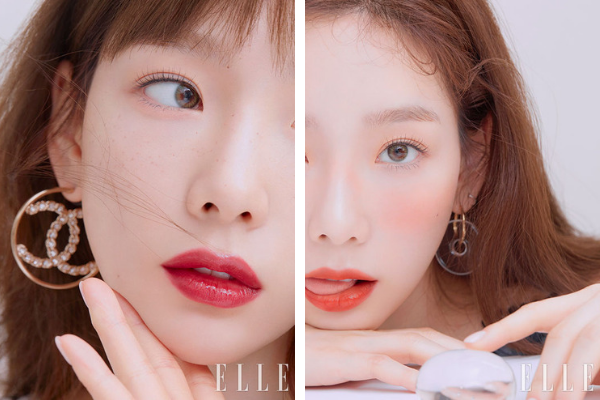 As each member shared what object they brought for the ‘unboxing race’, members were teased or hurt by some of the items. Interesting segments were Yang Se Chan’s protein powder, Ji Suk Jin’s clothes from the 80s and Kim Jong Kook’s limited edition CD. Yang Se Chan brought an unopened container of protein powder he had bought at a whim for dieting. When asked if the protein powder was strawberry flavor, Yang Se Chan confirmed yes. Hilariously Haha read the label and pointed out it was actually chocolate flavor. Further telling Yang Se Chan that just because the container is pink doesn’t mean the protein powder is going to be strawberry flavor to everyone’s amusement. Ji Suk Jin complained of his wife’s tendency to throw things away while introducing his item. Kim Jong Kook commented Ji Suk Jin should be thankful his wife hadn’t thrown him away or else. Ji Suk Jin shared he brought a meaningful item that was when he was a fashionista decades ago. Kim Jong Kook’s item was Haha’s reggae limited CD box that Haha had gifted a long time ago. Haha expressed his disappointment and pointed out that CD box wasn’t even commercially sold but given to fans during one of his concerts. Kim Jong Kook stated he cherished the CD box but couldn’t really use it. Haha expressed he’s thankful Kim Jong Kook kept it until now instead of trying to sell it on a second hand website. Kim Jong Kook comments he couldn’t sell it since Haha wrote a message to Kim Jong Kook on the CD box. Once everyone had presented their item, members were divided into teams to try to exchange the items for something more expensive to gather enough finding for their mission. Hence, the members were divided using the PPL (product placement) Samsung’s new phone that now has the fingerprint reader on the front of the screen + wireless earphones chargeable from the phone. Each team tries their best to trade their items with various celebrities. Hilariously Ji Suk Jin’s clothes were traded with SF9 members. The clothes that had looked “questionable” became so fashionable when worn by the idols. 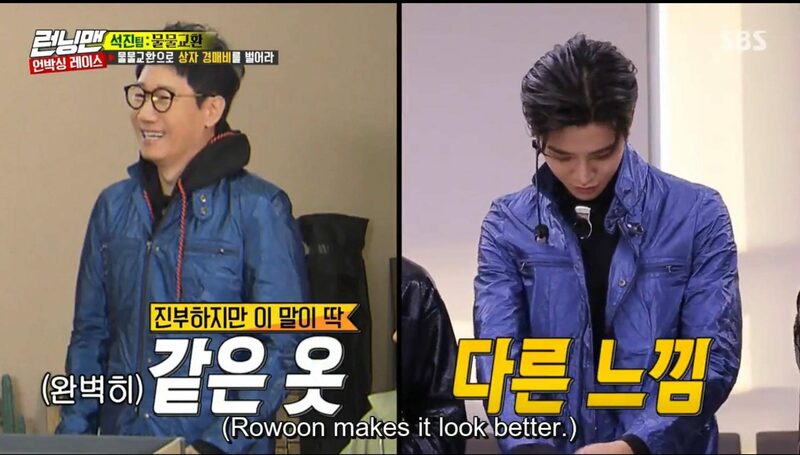 SF9 members Chani and Rowoon looked ready for the stage in Ji Suk Jin’s clothes. Lee Kwang Soo’s figure cut out was valued at 10 cents, 2 dollars and later 50 dollars in Hwahakdong. Yoo Jae Suk was amazed at Lee Kwang Soo’s item being valued at 50 dollars even if the offer was for the buyer’s daughter (a huge fan of Lee Kwang Soo). 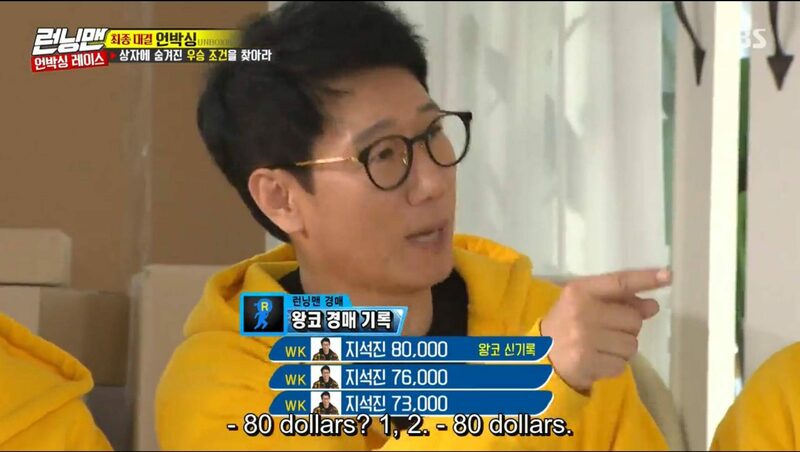 It was funny to see Yoo Jae Suk trying to decrease the price telling the buyer its not worth 50 dollars. 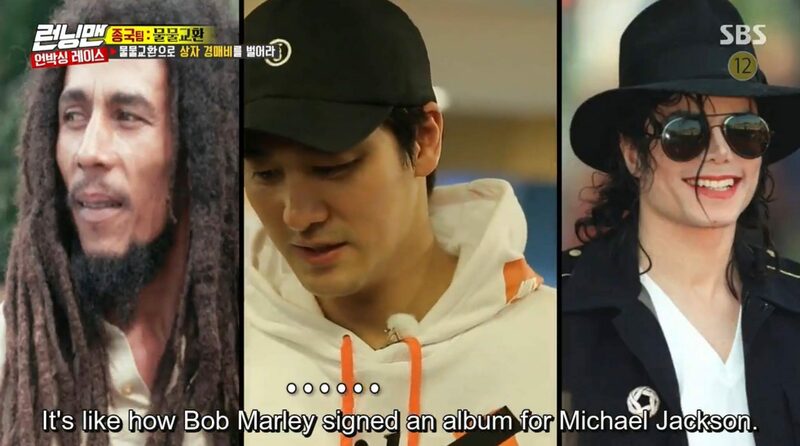 Kim Jong Kook and Haha sell of Kim Jong Kook’s item by comparing Bob Marley giving a CD to Michael Jackson. The show commented on how thick faced Kim Jong Kook and Haha are for daring to sell of the CD for limited edition Michael Jordan sneakers from actor Oh Chang Seok. Each team aimed to gain the most amount of funding to use during the auction to complete this week’s episode. Unfortunately, many were disappointed to learn some of their items had lower value than expected. 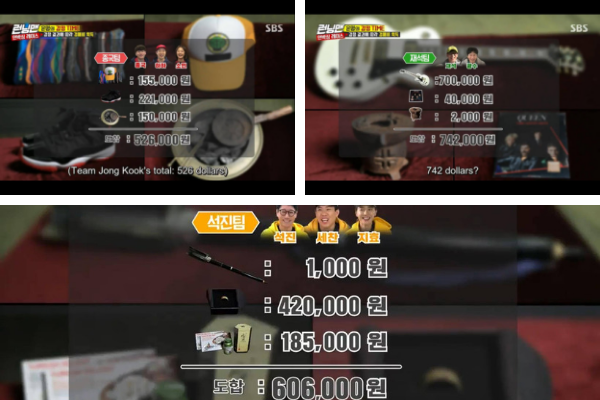 In the end, Yoo Jae Suk & Lee Kwang Soo ended up gathering the most funding thanks to Yoo Jae Suk’s item-electric guitar. Each team used the funding from their items to buy the boxes at the auction. From a total of 50 boxes, 10 boxes were reported to have a cellphone that contained clues to completing the mission. Each team gambled on which auction item would have a cellphone for completing the mission. 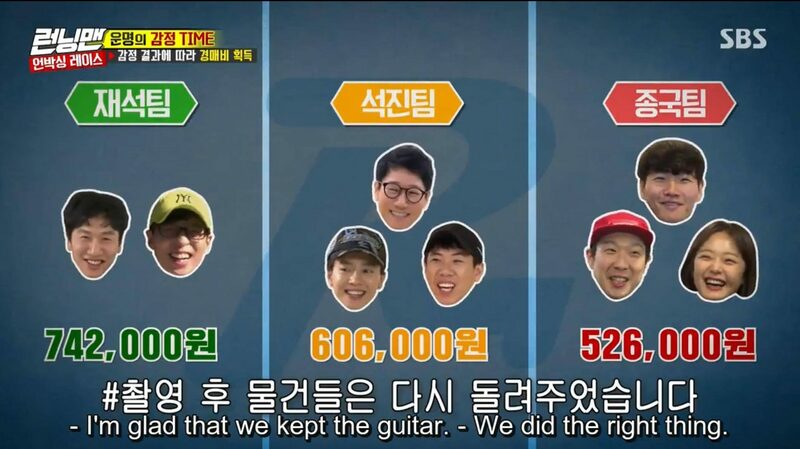 Not surprisingly, Yoo Jae Suk & Lee Kwang Soo had the advantage since their team had the most funding. Ji Suk Jin caused everyone to be exasperated when he kept increasing the bid. Ji Suk Jin would call out the highest bid followed up increasing his bid again for no apparent reason. All the members asked why he would increase his bid when he doesn’t have any competitors. Team Yoo Jae Suk and Lee Kwang Soo successfully bidded for boxes that had clues for completing the mission. For winning the mission, Yoo Jae Suk and Lee Kwang Soo were told they could pick any of the remaining boxes to take home. If it had a cellphone, it was theirs to take. Yoo Jae Suk and Lee Kwang Soo ended up picking a box with jump rope and an empty box respectively making them the winners but also the losers of the episode. All of their hard work resulted in receiving neither prize nor punishment. Songs from Queen and BTS were used a lot in the background. This week’s episode felt rather bland compared to other episodes. ‘Running Man’ ratings have been on the decline in the recent years but comparing this episode to the most recent episodes, this one was not entertaining as the past ones. There were definitely some funny moments throughout the episode but it didn’t feel especially enjoyable.